Fossil records indicate that over the earth’s history sponge reefs have created the largest biological structures that have ever existed on planet, with some encompasing 4,300 square km, nearly double the size of the great barrier reef. These incredible structures were thought to have been extinct until 1986, when an oceanographic survey in the Queen Charlottes discovered a 9,000 year old sponge reef in Hectate straight that was 8 stories high and 700 square km. 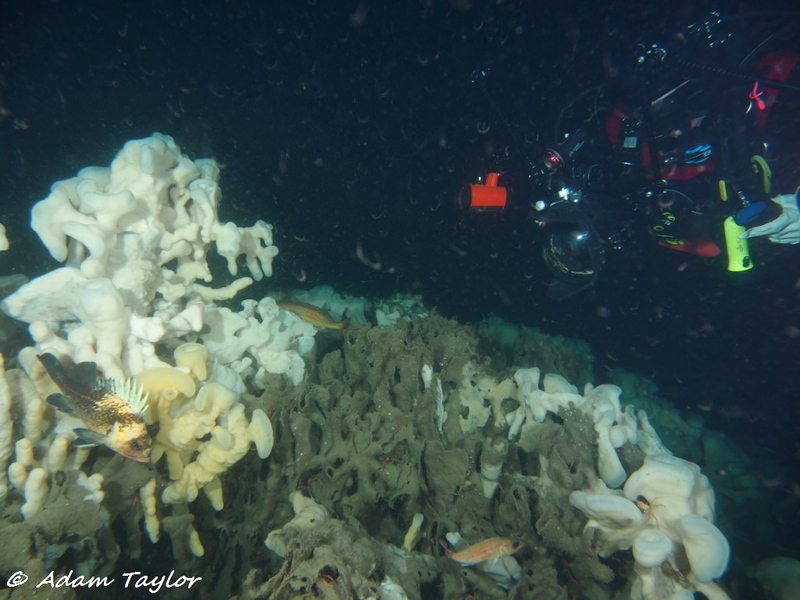 At least 3 of the sponge reefs identified in Howe Sound so far are diveable! Sponge reefs in Howe sound exist at depths of 90-160 feet, and are some of the only diveable sponge reefs in the world! For the last several years, MLSS has been actively working to map the distribution of sponge reefs in Howe Sound using drop-camera video. To date we have identified at least 10 sites which are full sponge reefs, and many other sponge gardens (areas with impressive sponge formations but where there is not extensive reef formation). MLSS is working hard with DFO, the fishing industry and other organizations to achieve protection for these incredible marine habitats. Sponges offer important habitat for a variety of marine life and are important for fish and marine invertebrate reproduction, potentially acting as important nursery grounds for juvenile rockfish. Sponges are also important filters and 1 sponge can filter 9000L per day. There is still much unknown about their role in the ecosystem and the presence of sponge reefs at diveable depths offers researchers a great opportunity to study and better understand these incredible ecosystems.